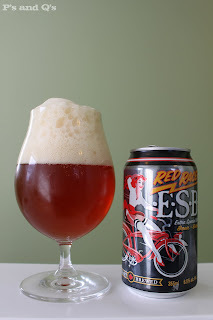 You know... well, you probably don't... this is the second Red Racer / Central City Brewing Company beer I've ever had. Their first, the IPA, is probably about the highest I've rated any beer... it's definitely an all-time favourite at the very least. So... this ESB has an awful lot to live up to. First off, it looks fantastic. A slightly cloudy, deep amber with some reddish tint to it. The off-white / cream-coloured head is massive. It forms fast and tall. As it starts to lower, large bubbles / pockets form in it, and the top of it stays firm and creamy, almost like a light meringue or beaten egg whites. Sticky lacing follows it down. The smell? I don't like to rave, but... Oh. Mah. Gaw. It's awesome. Just my kind of aroma. The hops are strong with this one... it reminds me of the IPA. Citrus, like grapefruit and mandarin orange, lay over top of a pine scent - very bright and fresh. There's a nice, slight malt sweetness to it, too, which helps to round it out... a bit of caramel, I suppose. The taste? Whoa... that's a little different. It doesn't seem to match the scent a lot. The first sip is very... sweet, and a bit sour. It's almost like a fruit punch, in a sense... with a bit of citrus in it, and something sweet... like a caramel syrup. It throws me off a bit. Let me eat some crackers and see if that balances things out a bit... (eats crackers, tries again). A bit, but it's still different than what I expected. I expected something maltier and smoother, like the Vache Folle ESB I had recently. This one is much fruitier and less mellow. Must be the West Coast interpretation of an ESB - an ESHB (Extra Special or Sour Hoppy Bitter). There is some malt in there (more as it warms up a bit), but I find the hoppiness and especially the sour slant seem to mask it almost entirely. It's still OK, but I'd rather see it be smoothed / evened out a bit. It's a little prickly in its carbonation. Not aggressive, but some might find it a bit sharp, especially at first. The body is medium and the overall mouthfeel OK. The finish is fairly well-balanced... a bit dry, a bit wet, a little bitter. The sourness still lingers for me, though. Overall, the beer's good. As an ESB, I expected certain elements. Then I smelled it and expected others. Then I tasted it and got completely thrown off... the taste didn't totally match either set of expectations. Next time, I'll be ready for this one. As it stands now, I wasn't completely won over. That sour element to it, compared to my expectations, really distracted my enjoyment. It got better as the glass went on, though, so I could see this being better if you had two or three, at a bit of a warmer starting temperature. You're right about the west coast take on a classic ESB. We load it with west coast hops. Not sure about the sour notes though? Perhaps something to do with shipping. We'll have to look into it! No problem. Thanks for stopping by the site.